You are here: Home / All posts / Celebrate summer with a Thirty-One giveaway! Celebrate summer with a Thirty-One giveaway! School is out, the temperatures are rising and it’s officially time to celebrate summer! Here is your chance to kick off the season with the chance to will a beautiful Thirty-One bag that has become a must-have for this mom! A few weeks ago I was contacted by Mary Williams, a local Thirty-One consultant, offering me the opportunity to choose anything from their current catalog, review it, and then give away a new one to a lucky reader. I’ve been to a few Thirty-One parties in the past, have several products in my house, and love them all. How could I not jump at the chance?! As I perused the catalog, there were a few things that caught my attention. I could totally imagine using the market thermal tote for lunches at the beach or park. I was also dreaming of all the things I could keep in order in the organizing utility tote. It seemed like the perfect bag to sit between my two children on a long road-trip, each compartment filled with something different to do. What I ultimately chose was the organizing shoulder bag and let me tell you why. 1. While it can be worn on your shoulder, it fits incredibly comfortably across your body, totally eliminating the possibility that it will slip off. Even though my children are not toddlers anymore, there are situations, especially in crowds, when I reach for their hands. Ever take a little one by the paw and have a two-ton purse slip off your shoulder? You’re forced to do this weird maneuver to prevent injury. It’s not pretty. 2. The bag allows you to be totally hands-free. While walking around the mall today, it was awesome to not battle with it while carrying four bags and keeping track of my daughter. 3. It’s just big enough to hold what you need, but not too big that it’s in the way. The zip-up inside comfortably holds my wallet, hand sanitizer, lip gloss, business cards, brush, sunscreen, and if it’s a meeting day, my iPad. I keep my car keys and iPhone in the outside zipper section for easy access. In the back open pocket, I keep my note pad and pen. If I had babies or toddlers, I could easily stick a diaper or two and small pack of wipes in there. There is also plenty of room for necessities like small snacks, band aids, or camera. 4. It keeps what you need close to your body, reducing the risk of theft. If you’re somewhere using a shopping cart, there isn’t a need to sit your purse in the seat. If you’re in and out of stores, there’s no chance you’ll set the bag down somewhere and forget it. 5. It will rock your world in any vacation situation. What truly attracted me to this bag is how I would use it in Disney World. If you look through my last nine trips to the happiest place on earth, you’ll see a collection of bags that just didn’t work out for one reason or another. One recurring character is this small purple cross-body bag that resembles something more like a *cringe* fanny pack. But as smartphones were introduced, this bag that was designed for something more the size of a flip phone became useless. And seriously, as I flip back through the scrapbooks, I realize this happened not a moment too soon. During our last trip I had this great cross-body purse that was bigger and a lovely shade of olive-green. It was inexpensive and from Wal-mart, but I was certain it would enter beloved status. Two days into the trip, my family kept referring to it as my “satchel” and calling me “Doctor Jones.” I’m not the biggest Indiana Jones fan, but the reference was noted…and not appreciated. Shortly after, the zipper broke, requiring me to actually rip it to get my things out. Waste of money and, apparently, not as cute as I thought. It was time for something durable, functional, and pretty. As I was reviewing this bag, I began noticing so many friends with it. One said it’s like the “Baby Bjorn for mothers without a baby” because it’s hands-free. 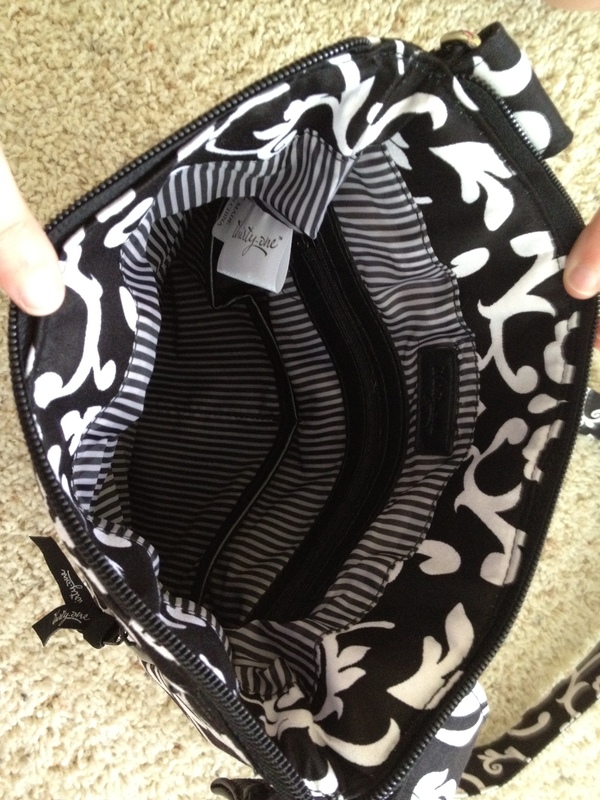 She also said it fits tons of stuff in it with plenty of zipper compartments for anything you want to keep separate. She keeps her Kindle in the deep back pocket. She also loves the design and gets compliments on it all the time, even after wearing it for over a year. Another friend said that she easily fits two Nintendo DS’s and her Kindle Fire in it and also loves the style. 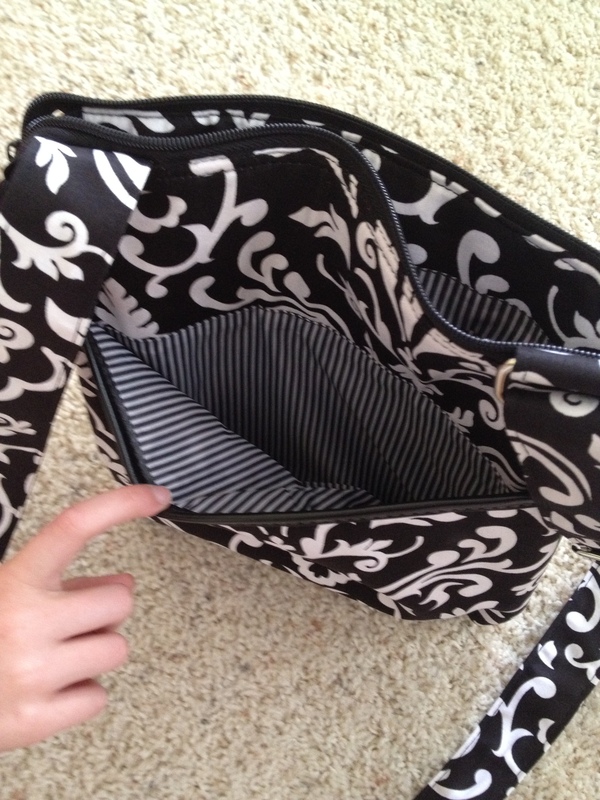 The Thirty-One organizing shoulder bag is perfect for all of the out and about summer holds. It’s the right size and weight. The cloth is very durable and resists stains. The strap is adjustable to just the right length and it’s comfortable on your neck. The fabric options lets you choose something right for your style and preference. You can also have it personalized for that added special touch. Are you ready for your chance to win one? There are a few steps, but they’re worth it. Visit Mary Williams’ Thirty-One site, which includes her contact information, and flip through the catalog. In a comment on this post (no posts on Facebook or Twitter will count as entries), tell us which product you would choose and how you’d use it. One comment will be selected at random as the winner. To be eligible you can only enter one time and must provide a valid email address (which will not be displayed) so I can contact you if you win. The contest runs from Monday, June 4, 2012 to noon, Friday, June 8, 2012. The prize is one Thirty-One organizing shoulder bag in your choice of fabric and personalization. The prize will be delivered directly to you from Thirty-One. If you are the winner and do not respond to email notification within 72 hours, another winner will be chosen. Mary Williams, Thirty-One consultant extraordinaire, is available for at-home, office, catalog, or online parties. She also does fundraisers and takes individual orders. She has a Facebook group where she keeps members up-to-date on the latest promotions, specials, and new products. To join it, just click “Join group” in the upper right-hand corner and Mary will happily add you. And as an added bonus, she’ll give anyone who books a party and mentions MyrtleBeachforFamilies.com a 20% in hostess reward! Thank you very much for reading and good luck! I’m with you- I’d choose the organizing shoulder bag. I’d love to have a cool looking purse that would hold my iPad. While I have been dreaming of a utility tote for some time now I believe my first choice would be the Thermal Tote. I have two young girls that I love to take to the beach in the summer. A lot of the time it is difficult for me to take everything we need to the beach for a day in the sun while my husband is at work. Dragging our cooler full of snacks has become nearly an impossible task but you always need something to keep drinks, sandwiches, and snacks cool. A Thermal Tote would solve this problem! It would allow me to pack the things we need, keep them cool, and free my hands for little hands, buckets, and chairs. I would like the metro retro bag. I would use it as a purse mainly. Though it also could be used at the race, we go to several Nascar Races through-out the year. I would choose the tote-ally awesome tote in color Deep blue rings. I would use this as a beach/pool bag … it’s color wouldn’t even embarass my husband, ha ha! Love that it’s laminate lined! Love this!! I also love the Cinch Sacs and the Cindy Tote! I would choose Product # 3045, the Zipper Pouch, in Black Paisley Parade. I bought one for my daughter a few years ago and I am always “stealing” hers! I find so many reasons to use it, and I would love to have one of my own. Its great for toiletries for an overnight stay (I can quickly throw in my full size products), beach accessories (like sunscreen, hairbands, sun glasses, keys, etc), toys for a short car ride, snacks, school supplies…I could go on and on! Oraganizing Utility Tote is so cute! I like the large utility tote and would use it to organize the back of my van. A place to keep reusable shopping bags, diapers, and other things that stay in the van. I like the Retro Metro bag because of the design. I would take it with me on day trips because it’s a good place to store things. I know nothing about Thirty One but keep hearing it mentioned. Would love the opportunity to see what Thirty One is all about. My contact information is on the website and facebook page, I’d love to share Thirty-One with you! While I’ve been eyeing the retro metro bag, I do believe the organzing shoulder bag would be awesome as well! Reading the review helped me see how convenient it would be to own one of those particular bags. I didn’t realize you could carry an ipad inside this bag. Looks can be deceiving!! I do believe I would still have to buy a retro metro bag at some point, cause I carry everything but the kitchen sink on trips, especially. Either bag I end up with at first, would be a win-win situation!! 😉 Love 31 products! Love 31 and their products! I love the XXL Utility Tote! It would be so useful with our family! I would love a skirt purse, it looks fun and you can change the skirt with your outfits. Being practical though, I’d choose a large utility tote to carry the kids soccer gear, drinks and snacks to the fields. Love the rolling tote…for the beach or travel! I would Love the organizing shoulder bag as well. We are going to Disney this summer and this would be the perfect bag, easy to wear across the body and no worries of losing it on rides throughout the day. Large enough to hold the need items like room key cards and cash, but not so bulky it would get in the way. Love so many of these items!! I think my favorite is the retro metro bag. I love that it isn’t too big, but has loads of pockets which are key for me! I like my bags organized. I could really use an organizing utility tote for my trips around town. It would hold everything I need for me and my kids! teacher gifts I have received the past couple of years!. I do not have one of the large totes which would be perfect for the pool or beach. I can never fit enough towels, goggles, swim toys in the bags that I have already. Hmm.. I’d take ANY Thirty-One bag for free, but would like the one you described Melissa; the organizing shoulder bag. As a very busy mom of 5, hands-free is good. knowing your stuff is safe is even better, as we travel overseas with our kids, too. I bet it can hold 7 passports! I NEED the Retro Metro Weekender so I can quit schlepping my stuff around in an old Tupperware Duffel Bag!! I really have enjoyed searching through your catalog, I feel the choice I would go with is the Lg Utility Tote. As I travel every other week up to the infusion clinics , sitting there for 6-7 hrs can become quite boring & make you want to snack alot. The LG Utility Tote seems like the best looking all in one useable styish bag I have seen. The large utility tote would be my first choice. It has such a multi purpose use! From the pool to the beach. Traveling back and forth to see grandparents I would put the tote between my two children and it would hold all their electronics, snacks and drawing supplies. Love thirty-one and all the fun styles to choose from!! Thank you for your comments! The contest is now closed and the winner will be announced shortly.